For ither uises, see Alexandrov. 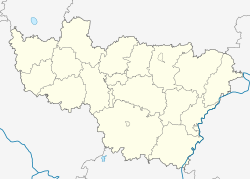 Alexandrov or Aleksandrov (Roushie: Александров) is a toun an the admeenistrative centre o Alexandrovsky Destrict o Vladimir Oblast, Roushie, locatit 120 kilometers (75 mi) northeast o Moscow. Population: 61,551 (2010 Census); 64,824 (2002 Census); 68,220 (1989 Census). Alexandrovskaya Sloboda (the umwhile name o the dounset) servit as the caipital o Roushie for three months (December 1564 tae Februar 1565) unner Tsar Ivan the Terrible till he greeit tae return his court an the relics o Moscow which he haed taken wi him. Ivan agreed tae return efter the kirk gae him permission tae foond the Oprichnina. It wis grantit toun status in 1778. ↑ Энциклопедия Города России. Moscow: Большая Российская Энциклопедия. 2003. p. 16. ISBN 5-7107-7399-9.